I know it may look or sounds amazing to access a computer hardware with a smartphone. There are lots of things a smartphone can do which are steadily being discovered every day . Some PC users have downloaded and installed heavy apps just to have access to their computer 's hard drive, but you don ' t necessarily need them . Your Android’ s file explorer is enough for this task . There are no restrictions on the steps I ' m about to show you because you can copy and cut big files and software , move them , and easily do other adjustings . 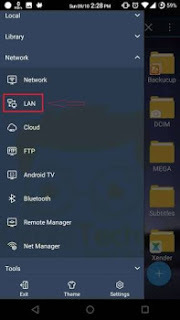 First or all, You need to be connected to the same network (Wi- Fi) before using this steps. Once you are connected, follow these steps below. Step 1: Right-click on the drive you wish to share , then use the below -mentioned path to share this folder. You will see an icon appeared which mean the drive is shared . Properties - Sharing - Advanced sharing - share this folder.